*Stellar is a relatively rare non profit non proof of work blockchain group, but they are still "centralizing" many projects' data on a distributed but singular ledger. While there are advantages in being part of something big, independence and simplicity are not among them. *Assign Onward is open source, open license, so, if an investment firm wants to use all or part of the Assign Onward concepts and code in a project of their direction, they are free to do so. hopefully recapturing some of the early Bitcoin enthusiasm for a project that individuals can profit in by participating. *Ironically, Microsoft is leveraging Ethereum to provide a similar Proof Of Authority system. I would assume that the largest monopoly in proprietary software history combined with the best funded and largest centralized blockchain development project would be focused on different target audiences than Assign Onward. used by PGP and in so doing it tremendously reduces the infrastructure and power requirements to securely process transactions, thereby removing the capital-intensive barriers to entry that Bitcoin and other highly developed projects have grown, and incidentally processing transactions for a tiny fraction of the power demands of a secure Proof Of Work based blockchain. layers of application interfaces, security protocols, etc. Assign Onward focuses on simple concepts and attempts to describe their functionality as simply, securely, and flexibly as possible. The hope is that a simple implementation can be more readily understood and adopted by a wide variety of users and developers. If Assign Onward enables small business owners and individuals to set up their own blockchain systems that they control and derive value from as DIY projects, then it has succeeded. *and if it is scaled up and also used by large transaction processors, so much the better. is where I can see Assign Onward becoming a significant part in the future of trusted exchange of contracts and records. No single blockchain system can, nor should even try, to rule the world. Millions, perhaps billions, of individually controlled blockchain systems voluntarily cooperating, that's the exciting vision. Prioritize your passion. It keeps you sane. What's in a name? Assign Onward was chosen as the project name because it conveyed the central concept of transferring shares from one participant to the next, a vague similarity to the well known meme "Pay it Forward," simplicity of the name, and widespread availability/uniqueness. *By mid 2018, everything with "coin" in the name was in use - most of them twice. ArrCoin was briefly considered for the Beatle-like alliteration to Our Coin, a collective... of pirates? Maybe not the best choice. 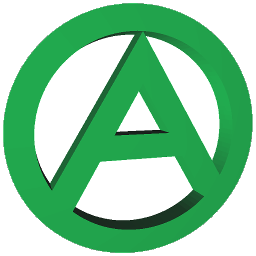 The A in circle logo was quick and easy to make in OpenSCAD, and I 3D printed a handful of physical Ⓐ tokens before noticing the similarity to J-Bone's forehead tattoo in Johnny Mnemonic. So, of course Anarchism is a thing, and mutualism has described mutual credit systems for over 150 years, so even though it was unintentional the symbology fits quite well. Of course, Anarchists have led a rough life with very limited acceptance or success in those 150 years, and I would hope that even if Assign Onward shares much of their philosophy and even symbology, that the Assign Onward systems of personal debt recording and exchange could find more acceptance in the future world than economic mutualism has in the past. I'll reserve judgement on what should or shouldn't be owned or paid for by whom and on what terms, but I will throw out there that: with the technology available today individuals can make their own credible promises of debt and repayment on their own terms and potentially reap much of the benefit that traditional banking and investment systems took from them, assuming that government regulations support or at least don't stifle these type of systems.